I am sorry but not too surprised that the 50th anniversary of the first U.S. Navy venture known as SEALAB seems to be passing with scarcely a tweet. Of course this year may already have given us a case of golden anniversary fatigue -- the Beatles invaded America; the first Ford Mustang rolled off the assembly line; the Civil Rights Act was passed. All this and more filled the 1964 calendar against the Zeitgeist-altering backdrop of the Vietnam War, the space race and -- cue the beloved theme song -- the debut of Gilligan's Island. But the lingering shadows of better-known milestones were not solely to blame for this summer's dearth of SEALAB tributes. 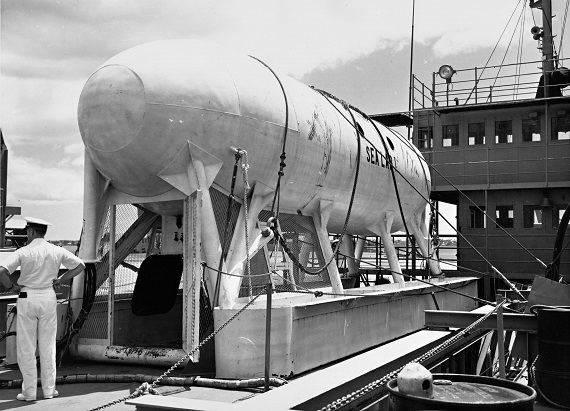 The stage was set -- or, rather, not set -- a half century ago when SEALAB I, a 30-ton prototype base that looked like a stout submarine, was placed nearly 200 feet below the Atlantic, about 25 miles off the coast of Bermuda. Most American media weren't tuned in to the game-changing significance of what was taking place, and consequently neither was the pre-Internet public. The "aquanauts," who were all Navy divers (can anyone name them? ), were never introduced with the kind of fanfare that accompanied, say, the Mercury Seven astronauts. Furthermore, many of the risks and challenges that came with the SEALAB setup never became part of the popular science lexicon in the way that something like the prospect of a spacecraft burning up upon re-entering the Earth's atmosphere did. One example: If an aquanaut swam for the surface for any reason -- sickness, panic, system failures -- he would be dead before he got there from "explosive decompression," a fate that's as nasty as it sounds. Another: SEALAB had an open hatch in the floor, so if the lab's dry interior lost its pressure, it would flood -- and that would be bad. Yet SEALAB wasn't just about setting up the marine equivalent of a space station to give divers unprecedented access to the seabed -- although that in itself was surely an achievement, one that a few others had tried out, mainly Jacques-Yves Cousteau and the American inventor Ed Link. But the SEALAB I venture in July 1964 earned its place in history for being the first full demonstration of both a greater depth and duration than ever thought possible. The 11 days that four aquanauts spent living and working 193 feet below the surface also offered solid evidence of the viability of a revolutionary method known as "saturation diving," so named because it involved allowing a diver's body to fully absorb the gases breathed under the pressure of a given depth. It's a little like a physiologically complex version of allowing a dry sponge to soak up a liquid -- until it's fully saturated and can absorb no more. Saturation diving ran counter to conventional diving wisdom but Capt. George Bond, an iconoclastic Navy doctor, believed it would enable divers to go deeper and stay down far longer than ever thought possible -- for hours, days, weeks, even months instead of the mere minutes conventional dives allowed. After SEALAB I, the Navy team fronted by Bond would aim for even longer stays, and depths of a thousand feet or more. Others jumped into this downward quest, too. But for all this SEALAB has long languished in a historical blind spot, as I was reminded again last year by an exploration-themed issue of National Geographic. It included a wonderfully detailed four-page timeline with all manner of exploratory milestones, from above and below the waterline -- but there was no mention of SEALAB I, or its more ambitious successors, SEALAB II and III. There aren't any Smithsonian-style SEALAB exhibits, and you're unlikely to be reminded of this pioneering 1960s program through your favorite news outlet, even in a series like CNN's The Sixties that aired over the summer (during SEALAB's 50th). When it comes to SEALAB these days, people are often more familiar with the Cartoon Network's off-kilter animated series SEALAB 2021, inspired by the earnest if short-lived SEALAB 2020, a Hanna-Barbera cartoon that aired in the early 1970s. Those who had a direct hand in the real SEALAB program are either too old, too modest, or too dead to be leading any celebrations of SEALAB at 50. So that's where I come in -- at the risk of appearing to herald this anniversary only to plug my book, which happens to be about... SEALAB. It's just that when you write a book like this you can't help but become nerd-in-chief for your story and subject matter, which sometimes means acting like the know-it-all in class who's always frantically raising his hand. So now my hand is up -- Oh! Oh! -- for the simple reason that SEALAB's golden anniversary is a worthwhile opportunity to refresh our collective memory -- and to alleviate a chronic historical blind spot. So, before another half-century goes by, let's pay homage to the U.S. Navy project that effectively dissolved the old diving limits and opened the door to vastly expanded human undersea capabilities. And let's not forget those first American aquanauts: Lester "Andy" Anderson, Robert A. Barth, Sanders "Tiger" Manning and Dr. Robert E. Thompson. Only Barth, a veteran of all three SEALABs, is still around to celebrate the 50th of a program that had a swift and lasting impact on military, civilian and commercial diving operations -- another reason to break out the champagne (although inside a pressurized undersea base, as Barth and the others found out, your bubbly won't bubble -- yet another quirk of sub-aquatic living). In the decades since SEALAB I, SEALAB II and even the ill-fated SEALAB III (think: Apollo 1 meets Apollo 13), a global workforce of saturation divers has played key roles in getting fuel from offshore oil fields into your tank. 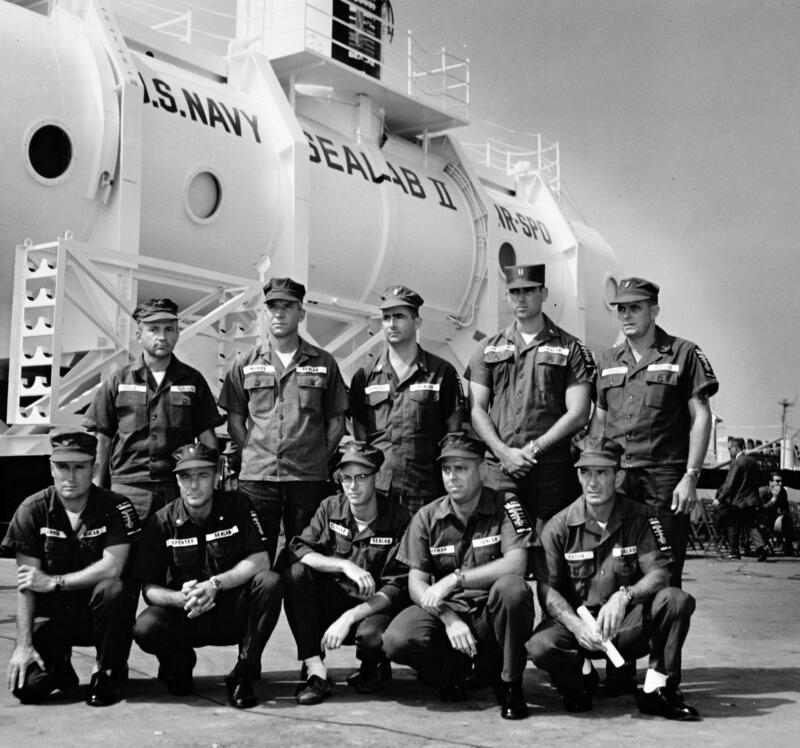 After SEALAB came to a premature end, a few months before the moon landing in 1969, the Navy secretly outfitted a series of submarines to take saturation divers on Cold War espionage missions. For marine scientists there's still the Aquarius Reef Base, a research outpost that's been south of the Florida Keys and about 60 feet below the surface for more than 20 years. It's a SEALAB descendant, as is the nearby Jules' Undersea Lodge, which started out in the 1970s as a mobile undersea research base before being converted into the world's only underwater accommodations. A number of other SEALAB-inspired bases have come and gone over the years, and some scientists wish there could be more, in order to gain more windows -- and doors -- into the world's oceans, which remain mostly unseen and unexplored. But maybe the next 50 years will be different -- something else to ponder while toasting SEALAB's anniversary.